Fast Facts: In 2012 A Siata won the coveted Cortile Cup "Best In Show" Award! Siata (Societa Italiana Auto Trasformazioni Accessori in English Italian Car Transformation Accessories Company), was an Italian tuning shop turned automaker founded in 1926 by amateur racecar driver Giorgio Ambrosini. Production of the Siata's first wholly original design the Siata Amica began in 1948 and continued through 1952. The Amica was powered by a Fiat 500cc engine capable of producing 22 horsepower with an optional 750cc unit producing 25 horsepower. The Amica was available in both two-seater convertible/spider and coupe configurations. 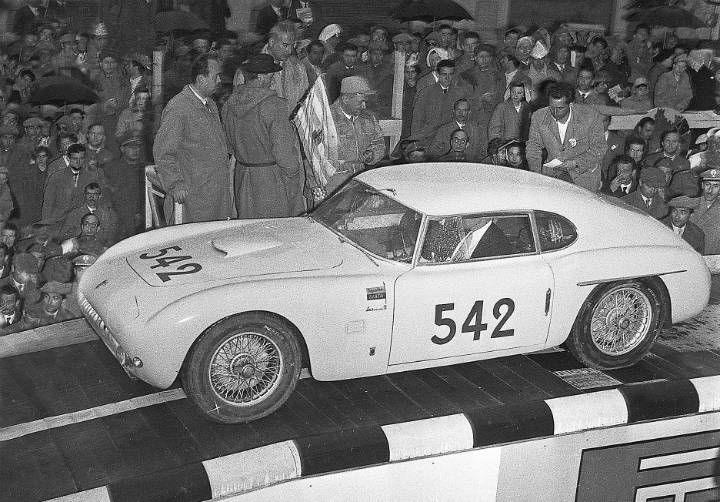 A specially modified Amica known as the Fiat Siata 500 Pescara won the 1948 Italian Road Racing Championship fitted with a 5 speed manual gearbox and a modified 500 cc engine producing 40 horsepower. Only two 500 Pescaras were ever built with only one surviving model. The surviving car also competed in the 1991 Historic Millie Miglia. Following the Amica, Siata introduced the 300BC Barchetta Sport Spider in 1951. The Barchetta Sport Spider was designed by Mario Revelli de Beaumont and built by Nuccio Bertone and Rocco Motto. Around 50 production models were created and predominantly featured either a 750 cc Crosley or 1,100 cc Fiat engine. During this time Siata also created the Cucciolo ("puppy") motor sold in kit form by Ducati and later used to power Ducati's first complete mopeds and motorcycles starting in 1952. Siata introduced the Siata 208s in 1953 featuring Fiat's 2.0 liter 8V engine. 35 cars were produced between 1953 and 1955 priced at 5300 dollars available in both convertible and hard top. The Siata 208-S was designed by Michelotti and hand-built by Bertone in 1953, utilizing the Fiat V-8 2-liter engine and four-speed transmission. The engine in this Siata has been enlarged to 2.3 liters and produces 137hp. Approximately 35 of the Siata Spiders were built, with most being delivered to the U.S. West Coast. The stunning, clean design provided many styling cues seen in later cars like the AC Ace, which later became the AC Cobra (look at the front of the Siata; you will see the beginning of the AC Cobra design. The car rose to prominence after actor and race car driver Steve McQueen purchased model BS523 from Los Angeles based Siata importer Ernie McCaffe in the mid-1950s. McQueen reportedly re badged the car with Ferrari emblems and dubbed the car his "Little Ferrari" Steve McQueen's Siata 208s was sold at RM Auction in Monterey in August 2011 for $946,000. In 1968, after a detailed market research among Italian youth, Siata launched the Siata Spring, a sports car based on parts from Fiat 850, with front end styled by Enrico Fumia in 1966,. The Siata Spring was produced until 1970, when Siata went bankrupt, but the assembly line was purchased by a newly formed company called ORSA (Officina Realizzazioni Sarde Automobili), which moved it to an assembly plant near Cagliari, where it resumed the production of the Spring based on the SEAT 850 Special, thus increasing the engine displacement to 903cc with 47BHP, disc brakes on the front wheels and a maximum speed of 125 Kph. Because of the 1973 oil crisis sales of sports cars in Italy went down, forcing ORSA to end the production of the Spring in 1975.